For a young nation built on the collectivist agricultural ethos of the Kibbutz movement, it’s perhaps no surprise that Israel’s agricultural technology startup ecosystem is booming. There are now more than 400 Israel agritech startups working on innovations for the global agriculture sector, according to new research from Start-Up Nation Central, an Israeli NGO and Greensoil Investments, a local agritech venture capital firm. These agritech startups are innovating across a range of challenges such as drought and water efficiency, as well as crop productivity and waste. While Israel’s agritech funding footprint might look relatively small compared to other leading markets such as the US — according to AgFunder, Israeli agritech startups raised just 2% of funding dollars in 2016 ($51.7m), accounting for 3.3% of deal-flow (19 deals) in 2016, while US startups raised 58% of funding dollars and 48% of deal-flow — this is still impressive with a population of 8.5 million next to the US’s 323 million. Israel is undoubtedly an innovation hub, and there are many serial entrepreneurs moving into agritech bringing experience, tech, methodologies, and connections from other sectors into the agritech vertical. Companies like ATP Labs and Agritask were founded by people moving from military data analytics and sensor technology, respectively, into the peaceful and impactful area of agritech. Israeli agritech is also growing in terms of incoming investments. Since the beginning of 2017, there have been many large investments such as Prospera’s $15 million Series B financing, Taranis’ $7.5 million Series A, a strategic $15 million investment in Hinoman, and others. Currently, Start-Up Nation’s online, searchable startup database includes more than 5,500 profiles of active, innovative startups across all tech verticals, including agritech. Along with Greensoil Investments, Start-Up Nation Central has used the Start-Up Nation Finder platform to build a taxonomy that identifies different sub categories in agritech. 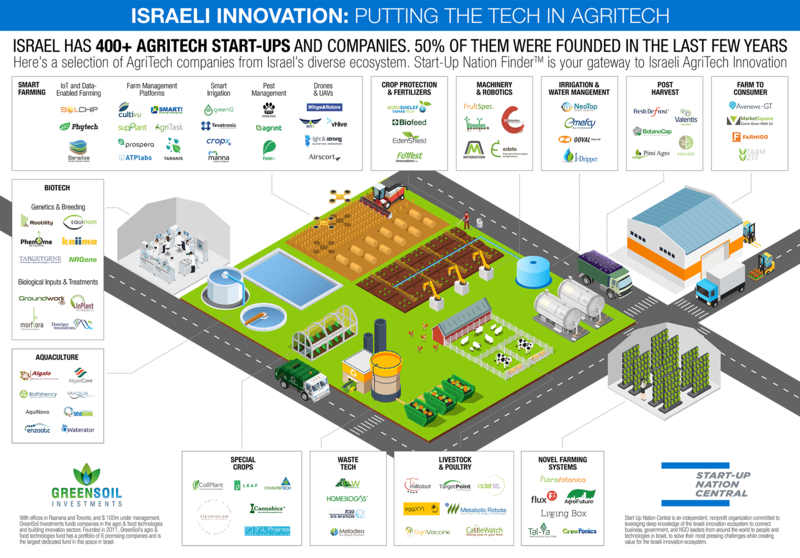 This has been visualized in an Israeli agritech market map along with a representative, and non-exhaustive, selection of companies in each category. Here is a description of each category according to Start-Up Nation and Greensoil, and some company examples. • Biotech – Typically involves breeding of plants and bacteria with improved traits to help plant growth. Some companies use genetic technologies for that. These include companies such as Groundwork BioAg, Rootility, and Kaiima. • Crop protection – Biological or chemical substances used for protecting the crops from pests & diseases, nontoxic and environmentally friendly. Companies like Biofeed which lures insects away or EdenShield. • Machinery and Robotics – Companies that build all kinds of robotics, machinery, and equipment used primarily to automate farm work, harvest crops and to sort it. Metomotion is one example with a robotic system developed for greenhouses. • Irrigation & water management – Israel is well known for water innovation, but there are new companies that are creating innovative irrigation methods and water efficiency, such as Neotop which covers water reservoirs and Emefcy which created an Energy-efficient Wastewater Treatment. • Post-harvest – Technologies to reduce post-harvest losses in diverse ways (e.g. storage, packaging, treatments and climate management technologies). An example for these companies can be found in Amaizz which deals with drying produce or Valentis Nanotech, which produces polymeric films for coating. • Farm to consumer – Companies that leverage new business models to shorten and simplify the supply chain by connecting the farm to the end consumer. Usually done through digital platforms. A good example would be Avenews-GT, which builds a digital trading platform connecting food wholesalers with producers. • Novel farming systems – Innovative systems for growing plants, new types of greenhouses, urban farming, hydroponics, and aquaponics. It could be small scale growing in the case of Flux or lighting solutions for farmers such as FloraFotonica. • Waste technologies – Processing livestock manure, fertilizer run-off, harvest, and food waste to reduce harmful substances and reuse the materials. Companies like 3PLW and HomeBiogas which convert organic waste to bioplastic and cooking gas, respectively. Click here to download your own free copy of the Israel Agritech market map. Start-Up Nation Central is an independent, nonprofit and nonrevenue organization committed to leveraging deep knowledge of the Israeli innovation ecosystem to connect business, government, and NGO leaders from around the world to people and technologies in Israel to help them solve their most pressing challenges while creating value for the Israeli innovation ecosystem. Start-Up Nation Central has curated the largest and most up-to-date collection of Israeli innovators and entrepreneurs, providing critical information on over 6,000 companies across dozens of industries. To search Start-up Nation’s Finder, click here. With offices in Raanana and Toronto, and $100m under management, GreenSoil Investments funds companies in the agro & food technologies and building innovation sectors. Founded in 2011, GreenSoil’s agro & food technologies fund has a portfolio of six promising companies and is the largest dedicated fund in this space in Israel. I am interested to invest in agritech startups in Israel or bring israeli startups to Brazil. I am already opening a startup in Israel.